This Knap & Vogt Single 35 qt. Platinum Trash unit with Pull-Out Steel Cages features Soft Close technology. The pull-out system installs with 4 screws (included). The unit holds one generous lidded 35-quart bin on a pull-out system. 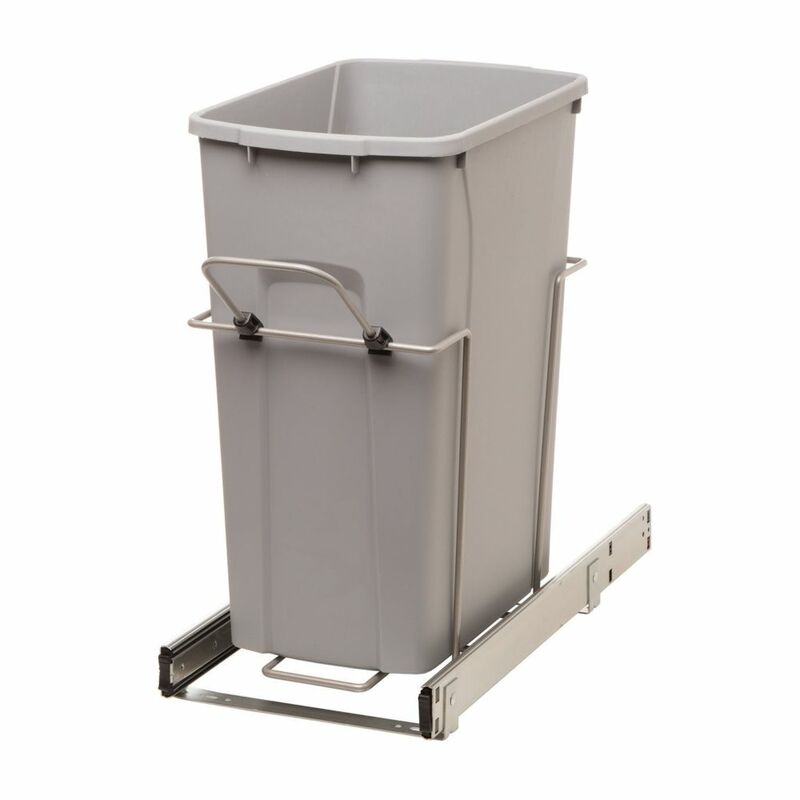 Knape & Vogts Slide-Out Wastebasket saves valuable kitchen space and keeps rubbish under control. Heavy-duty construction, durable epoxy coated slides and a generous 35-quart bin make this a winning choice for any kitchen. 35qt Bin Soft-Close Recycling Center This Knap & Vogt Single 35 qt. Platinum Trash unit with Pull-Out Steel Cages features Soft Close technology. The pull-out system installs with 4 screws (included). The unit holds one generous lidded 35-quart bin on a pull-out system. 35qt Bin Soft-Close Recycling Center is rated 3.3 out of 5 by 7. Rated 5 out of 5 by HomeDepotCustomer from This was a simple installation 10 min and done .... This was a simple installation 10 min and done . Just what I was looking for. Rated 5 out of 5 by Carol from Love it!... Love it! Rated 1 out of 5 by Nive from The trash can does not sit in the groove and hence does not work. Total waste of money and now I ... The trash can does not sit in the groove and hence does not work. Total waste of money and now I have to return it and look for another one that works. Rated 3 out of 5 by SadieSueMarie from Missing parts (although the manufacture sent the missing part right away. The thing I dislike ab... Missing parts (although the manufacture sent the missing part right away. The thing I dislike about it - is it seems to stick a little when pulling out and putting back in the cupboard. Rated 4 out of 5 by KK from I just put this in the kitchen today. It was easy to install and is a perfect fit for the cabinet... I just put this in the kitchen today. It was easy to install and is a perfect fit for the cabinet. I love that this can has a lid so that stinkiness stays contained. However, the lid seems to be a bit shoddily made---I am concerned that the hinge may snap at some point (very lightweight, cheap plastic). Nonetheless, I like the can a lot and am currently overlooking this cheap hinge factor since Home Depot apparently sells replacement lids. Also, as another reviewer previously stated, there is a little black plastic piece on the pullout handle that popped off almost immediately but does not affect the can's usage any, so it's fine, I guess. Rated 1 out of 5 by SP from Wrong Sizing Check the size. The item (verified part number is correct) shows the following sizing on the box. 20 x 9.75 x 19.75. If, like me, you are buying this item because of it's lower height (to fit under a sink for example) then you will be disappointed - it is a full 19.75" high and is the same model you can buy in a Home Depot store for about $45. It is an error on the website that needs correcting. Taking back tonight for a refund. How big s the garbage can that fits in this bracket?